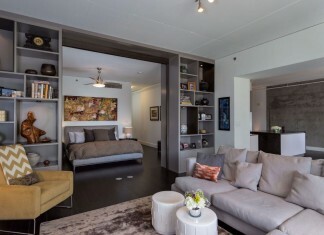 “For Manhattan pied-à-terre, commissioned by a Beverly Hills client to be a “residence as a work of art,” a one-bedroom apartment in a landmark Art Deco building was transformed into an open-plan space, rephrasing the Deco era’s visual vocabulary into a modernist discourse between art and design. 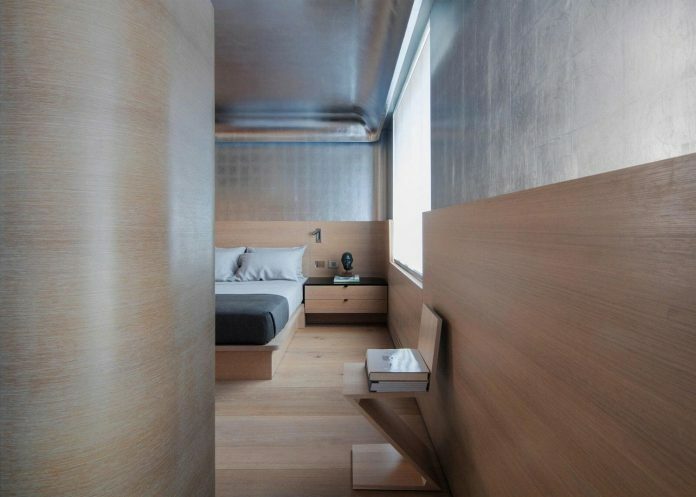 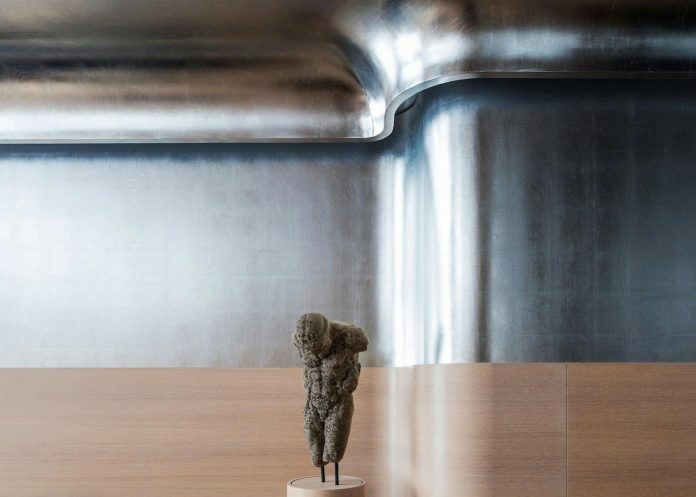 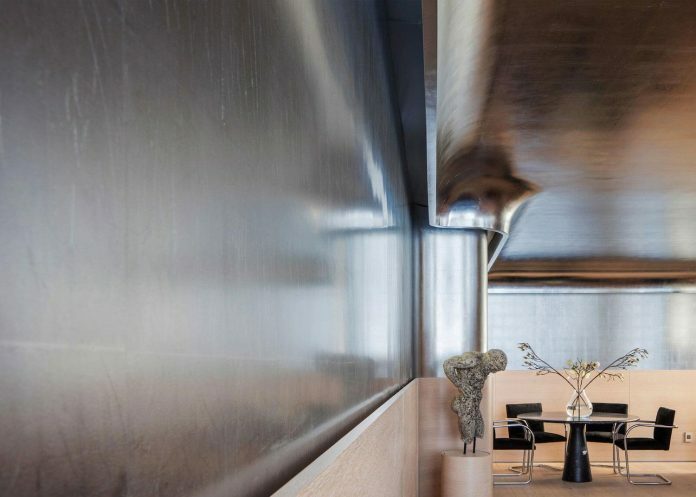 Inspired by the expressive, expansive compositions of Rothko and Sugimoto, interiors walls were removed to create a space where horizontal planes of silver and oak delineate the upper and lower halves of the apartment—evoking the juxtaposition of the earth and sky as well as the serenity of the metaphysical realm. 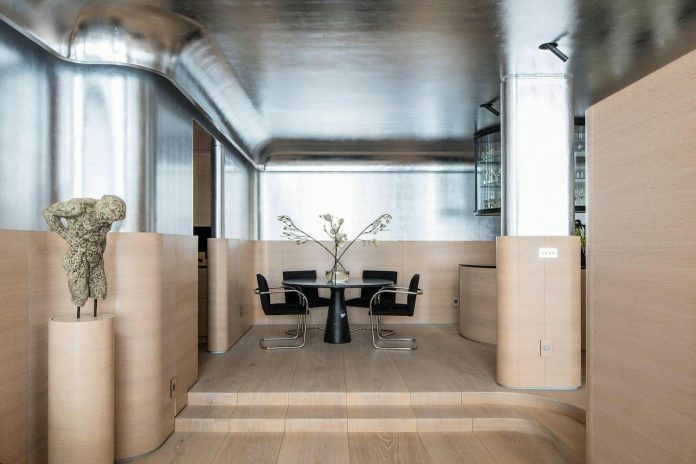 Hand-applied silver leaf on the upper half, intersecting with planes of oak wainscoting and wide European oak floorboards forms a flowing horizon line throughout the space. 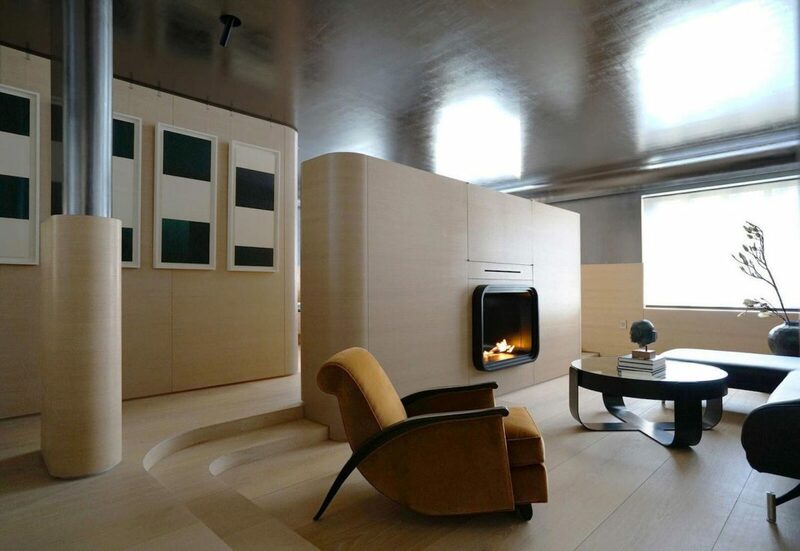 The line is re-traced with concealed lighting both behind the wainscoting and within the ceiling coves—infusing the apartment with a shimmering, ethereal light. 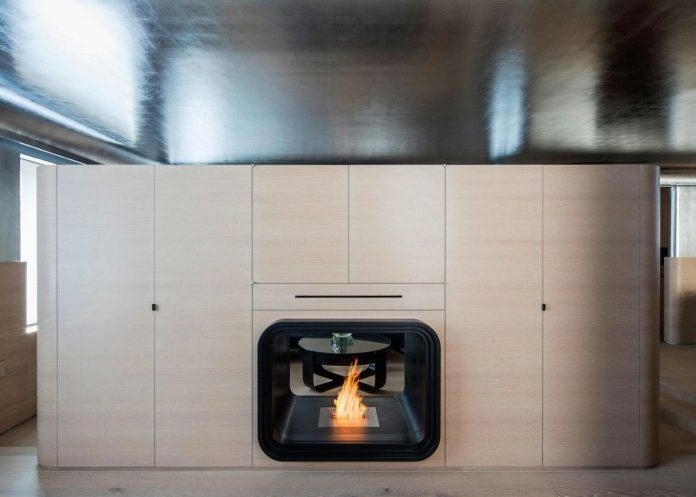 The fluid sensation of space and light is amplified through the erasure of right angles in apartment’s custom-built architectural elements—the walls, steps, ceiling, fireplace and cabinetry—all of which are articulated in curving design expressions. 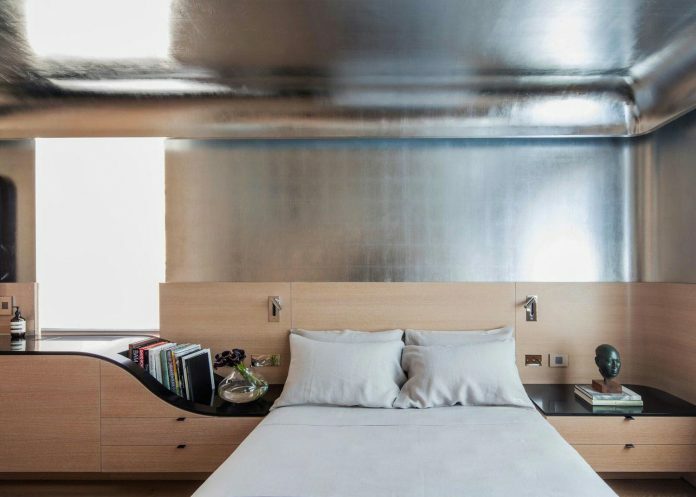 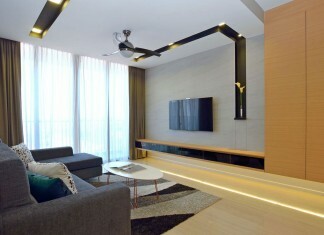 The dialogue between horizontal and vertical elements—such as the contour of the glass kitchen cabinet re-articulated in the interior steel design of the bathroom door; titanium tiles that envelop both the bathroom walls and ceilings; and the plane of Black Corian which beings on the wall, flows horizontally into a bathroom vanity and cascades into nightstands—creates continuous flowing lines that convey a sense of movement and extends the perception of the space. 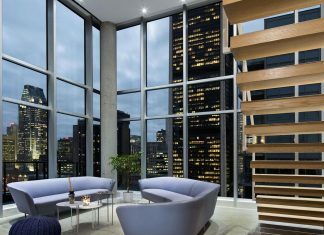 A Vladimir Kagan Swan sofa, a marble dining table, a Jobim 276 coffee table and a custom designed side chair reprise the curving profile, imbuing the space with a continuity of quiet, sensual silhouettes. 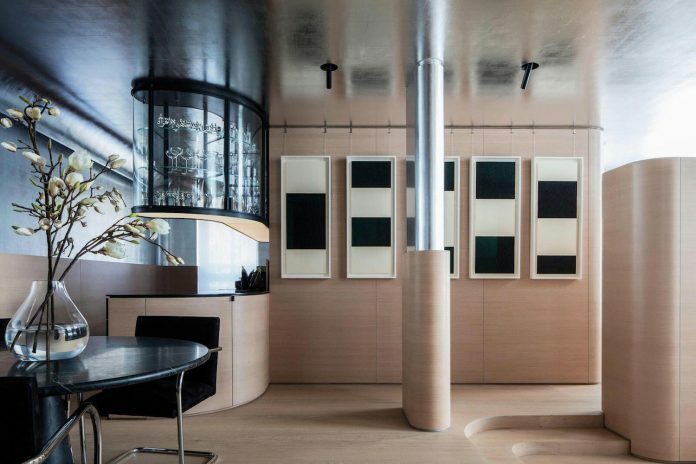 The geometric precision and lush paintstik texture of Richard Serra’s Reversals series, the sole artworks in the apartment, form a visual counterpoint to the smooth, flowing architectural materials and rounded silhouettes, and at the same time echo the visceral vocabulary of Rothko and Sugimoto.